A Celtic win today would give them a 5 point cushoin at the top of the SPL. Alex McLeish decided to gamble on deeply Religious Marvin Andrews after he had refused surgery on a cruciate ligament injury. Thomas Buffel was moved down to the bench because of his comments about the nature of Scottish football. Celtic had the return of their winger, Didier Agathe back in their squad for the first time since the last Old Firm game in February when Celtic lost 2-0. Celtic started brightly and Bellamy soon scared the home team with a run that was well saved at his feet by Rangers Goalkeeper, Ronald Waterreus. Celtic took the lead on 21 minutes though, after John Hartson knocked down, Didier Agathe crossed in for Stilian Petrov to head in. However, the Bulgarian midfielder was struck with a Coca Cola carton thrown by a Rangers fan. Stan Petrov and Craig Bellamy scored two sublime goals in the first half of today's Old Firm derby to hand Celtic a 2-1 victory at Ibrox. Stephen Thompson's goal in the last few minutes of the game gave Rangers a lifeline but the Scottish champions held out. Now the Hoops sit 5 points clear at the top of the SPL with just 4 games remaining. The match started in a hectic manner with Celtic looking to try and bag an early goal and looking the most dangerous of the two teams. And it wasn't too long before they did manage to get the opener, only 21 minutes into the game. Didier Agathe's cross into the box was met by an exceptionally accurate header from Stilian Petrov giving Rangers keeper Ronald Waterreus no chance. Petrov celebrated near the Rangers support and was struck by a missile but he was the one to be disciplined receiving a yellow card for his gesture towards the fans. It was 2-0 around 15 minutes later - Welshman Craig Bellamy netting this time. Celtic's bid for the SPL crown almost took another turn this afternoon after visitors Aberdeen found themselves 2-0 up within 15 minutes at Celtic Park. Zander Diamond and Darren Mackie gave the Dons their advantage early on in the first half to the shock of the 59,000 supporters who attended the match. But, unlike Celtic's previous home game against Hearts where they lost 2-0, the Scottish champions battled back and Stanislav Varga nodded home before the break. Minutes after the interval, Celtic were on level terms thanks to good work by Didier Agathe to allow Hartson to net the equaliser. Craig Bellamy intensified pressure on the Celtic board to fork out to sign him with a magnificent strike putting the Hoops 3-2 in front. And Martin O'Neill's men held on to their advantage although there were strong claims for a penalty after Craig Bellamy was brought down in the area but the match referee saw the challenge as legal. Celtic were away at East Lothian to play Livingston who are currently fighting for survival in the SPL. The last time Celtic played Livingston away they won 4-2 and were 4-0 up before the half hour mark! Celtic were hoping for the same sort of performance tonight. Celtic really didn't create many chances in the first half, Livingston playing defensively coping well with the Celtic attacking up until the 41st minute when the Livingston defenders looked asleep after a daflection off Livi's McNamee, meaning Hartson buried the ball into the corner. On the 54th minute Bellamy's pace took him towards the Livingston keeper and the keeper, Roddy McKenzie made a great stop to deny the Welshman. Halfway through the second period, Jason Dair made a fantasic attempt for a Livingston equalizer. His top corner bound shot was tipped over by young Celtic goalie, David Marshall. 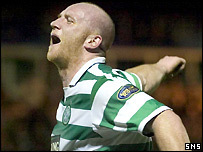 Hartson got his second on the 75th minute with a powerful header from an Alan Thompson corner. Celtic defeated Hearts 2-1 at Hampden Park this afternoon in the Scottish Cup Semi Final. The Scottish Champions were looking to get revenge following last week's 2-0 loss at the hands of the Edinburgh side in the SPL and within 3 minutes, Chris Sutton had made it 1-0. The Englishman rose above the Hearts defenders to meet Alan Thompson's cross and fire the Hoops into the lead. The scoreline stayed at 1-0 into the second half with Celtic dominating the match. And on 48 minutes, they were two goals in front. Craig Bellamy turned and shot low past Hearts goalkeeper Craig Gordon's near post. Hearts tried to get back into the game and their efforts paid off when substitute Deividas Cesnuaskis scored a magnificent lob over David Marshall with unhder 20 minutes remaining. StPauli 1916 Telly thread, what are you watching right now ? Name the Scottish National team manager you want.